Voltage-gated sodium channels consist one long polypeptide chain - comprising 1840 amino acid sequences. Each of such molecules has four repeat domains, each containing six membrane-spanning (transmembrane) alpha-helix regions, and in each of which the voltage sensor is located in the S4 segments, which contain positively charged amino-acid residues in their every third position. Such four repeat domains are suggested to cluster together so as to give origin to a pore. 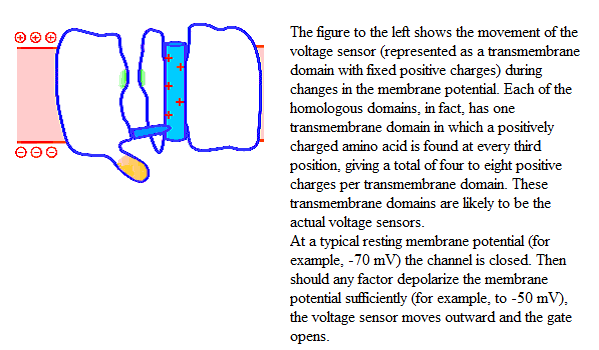 Such a pore is told to be closed whenever the membrane-spanning voltage is set at at value lying below the activating threshold level (inactivation gate). As a result whenever the membrane undergoes depolarization (that is when at the threshold level) the molecule is suggested to rotate so that its configuration allows the sodium ions to flow unhampered through the pore. Hence inactivation is removed when the membrane potential of the cell repolarizes following the falling phase of the action potential – which in its turn allows the channels to be activated again during the next action potential. Voltage-gated sodium channels are as a rule inactivated (closed), though commonly opening only for a short lapse of time, less than 1 msec. If inactivation is not removed, a globular portion of the protein swings up and occludes the pore, hence told to be inactivated – which blocks the channel. When the membrane potential repolarizes, the globular portion of the protein swings backwards to its starting position. Hence the inactivated channel gets activated again. 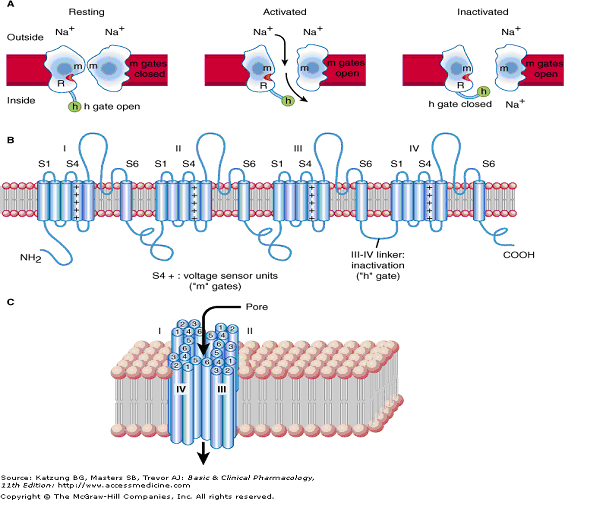 Voltage-dependent sodium channel is evidenced to consist of a large channel-core α subunit, held responsible for whatever pharmacologic and physiologic feature of such a channel, and of auxiliary β subunits. As already mentioned, the α subunit consists of four repeat domains clustering so as to give shape to a tetramer lining an inner central pore. Each domain in its turn contains six α-helix membrane-spanning regions, labeled S1 through S6. Voltage-dependent sodium channels are acknowledged to be highly selective, given that the allow the Na+ ion only to drift through the pore. Such a selectivity filter consists of 4 negatively charged amino acid segments (residues), attracting the positive Na+ ion, keeping out negatively charged ions such as chloride and binding together each domain S5 and S6 regions. Such proteic segments allow the pore channel to enable preferential trafficking as to the Na+ ion with respect to similar-sized yet different ions. Each domain belonging to the α. subunit is characterized by an α-helix voltage-sensing membrane-spanning region, that is 4S, often called gating helix and composed by densely packed amino acid positively-charged segments. The 4S α-helix transmembrane region – whose amino acids move outward and become exposed to the exoplasmic surface of the channel when the membrane is depolarized - senses the membrane polarity variations hence working as a gate in the channel opening or closing. As a matter of fact such an α-helix transmembrane region, whenever affected by a changing electrochemical potential, undergoes a conformational change sliding inward in the membrane, thus triggering the channel opening. On the other side, whenever the membrane potential is in a resting state (below -70mV) the sodium channels remain closed given that the 4S transmembrane α-helixes are not excited due to the amino acid positive charges allowing the elix itself to swing outwards towards the “negative pole” to be found on the membrane internal surface. Whenever the membrane depolarization takes place the 4S α-helix transmembrane region attraction towards the internal pole decreases – which means it possibly swinging the other way around, thus triggering the pore conformational change, in its turn enabling the channel to open, reminding that the sodium channels so very often close spontaneously soon after opening for a few milliseconds - forming an inactive channel that will not reopen until the membrane is repolarized. 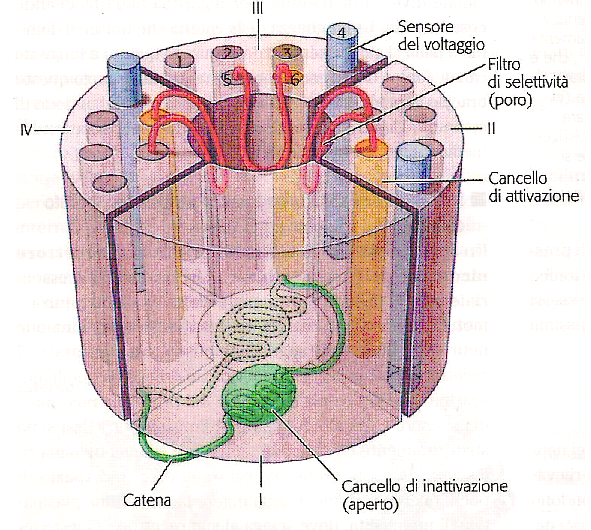 The “ball”, actually working as the very gate held responsible for the channel inactivation by plugging the channel mouth and to be located on the channel cytosolic surface. The “chain”, to be meant as a peptide short segment tethering the “ball” to the intracellular surface by the channel pore. Whenever the sodium channel is closed, the ball domain is released and free to move outside the channel, within the cytosolic layer. This notwithstanding, whenever the channel undergoes opening again as a result of excitation, it allows a given amount of sodium ions to flow through before swiftly reverting to the inactive state. As a matter of fact in the active conformation, a binding site answering to the purpose of tethering the “ball” – in its turn binding and hence plugging the channel, though by means of a reversible process - is made available onto the inner surface of the pore. Moreover the chain length has been shown to affect the lapse of time during which the ion channel is kept in its open state. More accurately it may be stated that the longer the chain the longer the lapse of time during the activated (open) condition of the channel occurs will be. Generalized epilepsy with febrile seizures, resulting from mutations affecting the SCN1A gene. Paramyotonia congenita affecting muscles used for movement (skeletal muscles) and whose mutated gene is the SCN4A one. Romano-Ward syndrome, caused by mutations in the SCN5A gene (such mutations include changes in single amino acids and deletions or insertions of a small number of amino acids in the SCN5A protein so that channels made with these altered SCN5A proteins stay open longer than usual, which allows sodium ions to continue flowing into cardiac muscle cells abnormally. This delay in channel closure disrupts the heart's normal rhythm, leading to irregular heartbeat) and also known as long QT syndrome type 3 (LQT3). limbic iper excitability triggered off by a mutated SCN1A gene. Dravet syndrome (also known as severe myclonic epilepsy of infancy or SMEI), triggered by mutations of the SCN1A gene. Autism is associated with SCN1A, SCN2A and SCN3A mutation. Brugada syndrome , where a disruption in ion transport changes the way the heart beats, leading to the abnormal heart rhythm (arrhythmia) is often found – alongside with a condition called sudden unexpected nocturnal death syndrome (SUNDS) – both of which are triggered by mutations in the SCN5A gene. Idiopathic ventricular fibrillation often coupled to Brugada Syndrome - whose mutated gene is the SCN5A one. Atrial fibrillation associated with genetic mutations in SCN3B and SCN4B, the genes encoding the two β-subunits of the cardiac sodium channel.